Parents would like to provide the kids with nothing but the best as much as possible. However there are certain conditions which lead them to sometimes cut back on these things. Having a lot of kids is very challenging especially when giving them the things they need and those that they want. With having a lot of kids also follow the need of having enough rooms for them to sleep in. The best solution to this problem would be to have the children share rooms. However I think we would agree that not all kids are happy to be sharing a room with their other siblings. Young as children are they already know how to value privacy and having their own personal space. If they cannot have their own rooms at least they can enjoy having their own beds right? Well, the want of at least having their own bed can be challenged by a bedroom with not enough space. If the room can accommodate only one double sized bed instead of two single beds placed far from each other then the kids may have no choice but to share the bed or have some of them sleep in the floor – which will surely lead to an outbreak of arguments and fights. This is where kids bunk beds come in very handy. 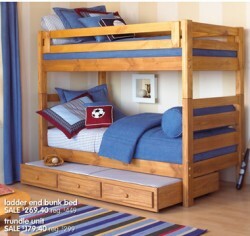 Bunk beds have advantages compared to other types of beds in terms of maximizing space and accommodating more people. This bed is perfect for big families who live in a house with not enough rooms for everyone. Even for those with only a few family members but live in a house with really small bedrooms, the bunk bed will surely fit in perfectly. There are different types of bunk beds that can be used for the kids rooms. There are bunk beds that aren’t just beds all throughout. The upper portion can be a bed and the bottom area can be utilized as a study or a closet instead. This is another way to use the bunk bed for a really small room. Even when the room is used just by one child, the bunk bed is still helpful in maximizing space and in giving the room more function. Kids bunk beds can also be built and put together in a very creative way. Parents can incorporate a theme on the beds like a play ground for example. Instead of having the usual ladders to go up and down the bunk bed, the kids can climb up fun shaped steps or ladders and come down a slide. This fun project for coming up with an interactive bunk bed can be fun for both the parents and the kids. So if you have a problem with bedroom space for your kids and sharing a bed is not an option then the kids bunk beds will surely meet the needs for personal bed space. Children can appreciate sharing a bedroom with their siblings as long as they are given their personal space by having their own bed to sleep on thanks to these kids bunk beds.